It was a cool morning. Not windy. Not hugely sunny. Ideal running conditions. I thought I’d drive to Rondebosch Common in Rondebosch. Rondebosch Common is an open common of about 40 hectares (100 acres) in Rondebosch, Cape Town in South Africa. 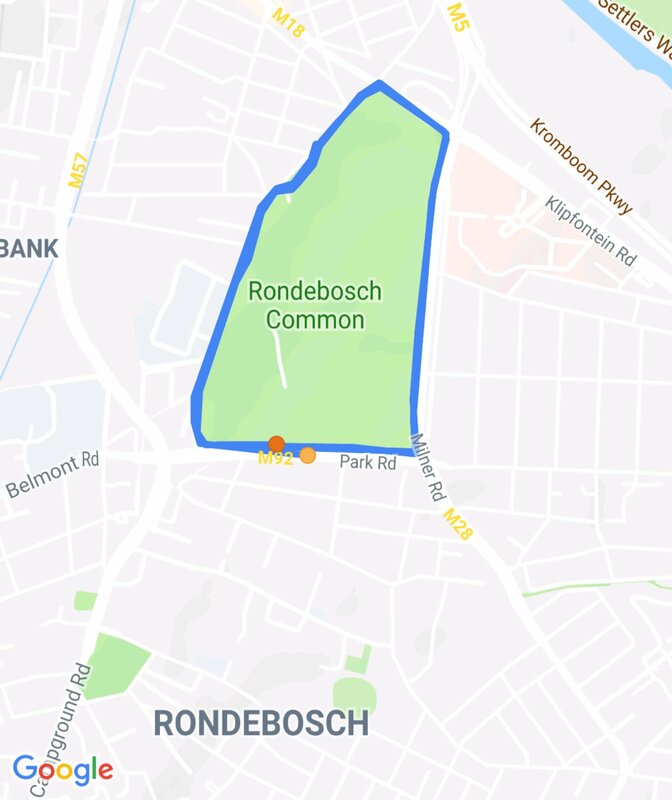 What Wikipedia doesn’t say is that Rondebosch Common is also quite flat. See, where I live is quite hilly. Not Sheffield hilly, but not far off. So if you go running around here, you will get some slower uphill bits where your calves are on fire and then some fast bits where your thighs die on the downhill. And that’s great if you like that kind of thing, but it’s not conducive to getting a decent time and gauging your performance on a level surface. That’s where Rondebosch Common comes in. I’ve only run there once before – I did a Parkrun late last year – but I was keen to see how quickly I could go today. Please bear in mind that I am not built for speed. I’m getting old, I have one dodgy knee and one dodgy ankle. Basically, these days anything under 30 minutes for 5km is quite an achievement for me. But conditions were ideal today and the ground really was rather flat, so I thought I’d give it a go. Suffice to say that my first kilometre was the fastest I’ve ever done, and suddenly, anything seemed possible. The following four were slower (although notably, the fifth was quicker than the fourth), but were still pretty good and I knocked over 3½ minutes off my best ever (pre-knee, pre-ankle) 5km time. 5kms this morning took me 23:12. The only downside of this supreme effort was the feeling that I was going to vomit up my lungs and then (obviously) promptly die. But what’s the point in just thinking that you might be able to do these things, and not actually going out and proving that you can (or failing, gloriously)? Pushing yourself to the limit every once in a while is something you’ve got to do. Never say never, they say, but I’ll never do this again. I could run much, much further than this, but I literally couldn’t run any quicker. I ran my first 10km for about 2 years this morning. This delay was mainly down to three reasons: injury, laziness, and injury and laziness. There will certainly be faster 10km runs done today, but they won’t be run by me. For the record, it was never my intention to run 10km this morning, but a combination of some poor planning and a lack of concentration left me about 5km from my house, having already run 5km. From that moment I didn’t have a huge variety of options available to me. The 98% humidity meant that I lost almost 1.3kg in (just over) an hour. If that rate of weight loss continues, I’ll be dead in several days. Thankfully, I intend to delay my imminent demise via means of a bacon butty, right now. After my problems with my knee at the beginning of the year (and then throughout the rest of the year, if we’re being completely honest), I’ve been working hard to put things right. I’m happy to say that it’s paying off. Some decent weight loss (still a work in progress), a huge improvement in fitness (also ongoing) and, this last weekend, a 5km run. Walking isn’t an issue, but that constant impact on the knee as one runs isn’t good. 5km might not sound like much, but given that I wasn’t sure that I’d ever be able to run again, it was huge. I was dragged out to try a flat parkrun on the weekend and – without wanting to blow my own trumpet – I smashed it. No knee issues whatsoever, and I finished feeling that I could have gone faster or further if I’d wanted to. Sure, a little muscle stiffness here and there the next day, but nothing terrible. And so now I’m moving straight onto the next hurdle: a game of football on Tuesday evening. Running apparently isn’t an issue, but that constant impact on the knee as one plays football isn’t good. A game of football on Tuesday evening might not sound like much, but given that I wasn’t sure that I’d ever be able to play a game of football again, it will be huge. Hold thumbs for great news on Wednesday morning. 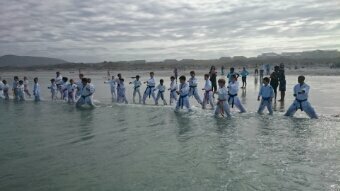 Early morning karate on the beach in Blouberg for the boy meant that I got to have a quick run along the sand there while he chopped and kicked. And once I got started, I kept going for what turns out to be my longest run since early September 2012. I did lose over a year somewhere in the middle of all that after that horrible incident with my right ankle, but even so, I’m chuffed. As some of you may already know, I had a bit of a tumble while out running this morning. My right foot found a well concealed pothole on Rhodes Drive near Kirstenbosch and I went A over T.
A quick phone call to my wonderful wife and the family ambulance – complete with concerned junior technicians – came to pick me up and get me to the local ER. No visible fracture to the sickeningly swollen right ankle, but either a Grade 2 or Grade 3 ligament tear. Cue Tramadol, crutches, bandage and RICE, together with a suggestion to contact the Orthopod tomorrow to see if it needs surgery. 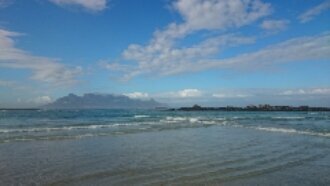 This year’s 2 Oceans suddenly looks a bit of a stretch – which ironically is something I really can’t do right now.